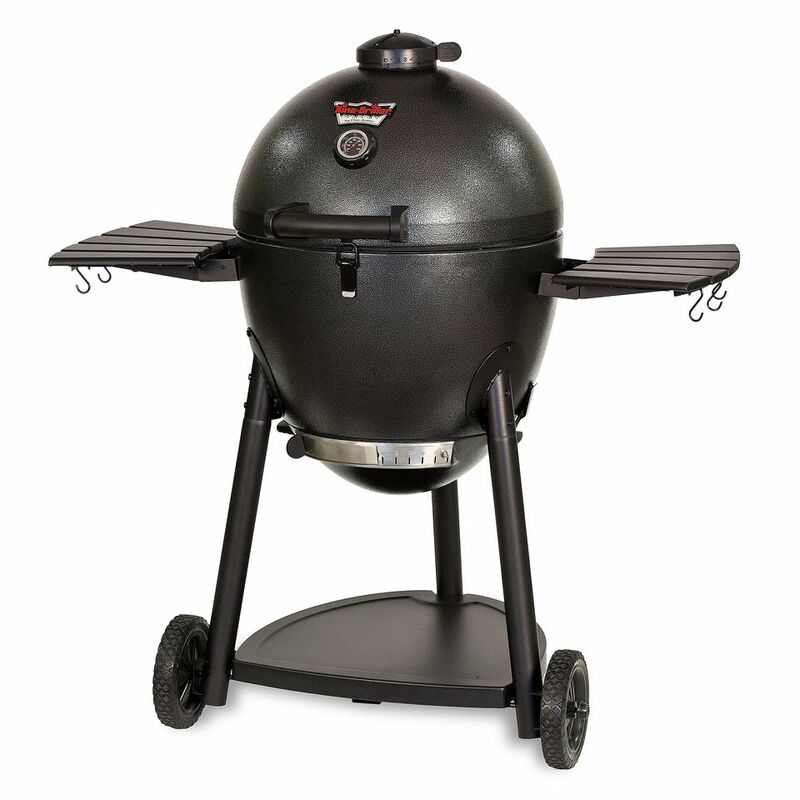 Traditionally, kamado-style cookers have been among the most expensive charcoal grills/smokers on the market. Originally made with a heavy ceramic shell, these grills seemed fragile (though they are not with proper care) and priced much higher than the typical metal kettle grills. The Char-Griller Akorn is a kamado-style grill. It has all the fuel efficiency, high-temperature cooking abilities, and low and slow capacity that the much more expensive units do, but at half (or even less) the price. While competently built and more than capable of keeping up with the competition, this model lacks the construction quality and long-term durability of those pricier other grills. The question you have to ask is, do you buy a cheaper grill to get into this style of grill, buy something more basic and far less money, or go big and buy one of those ceramic grills everyone raves about? A kamado grill is based on an ancient Japanese charcoal-powered cooker. Modified by GIs after the war, this design has become the pinnacle of charcoal grills and a very lucrative market. The Char-Grill gets to its lower price point first by swapping the traditional high-temperature ceramic for an insulated metal shell. Originally developed by a company called Bubba Keg (now owned by Broil-King and branded as the Broil King Keg) this metal body solution is lighter weight, less fragile, and cheaper to manufacture. The Akorn is not in the same quality category as other kamado-style grills, but then it isn't in the same price category either, and this is the crux of the decision. Do you swap long-term durability and quality for price? The advantages of any kamado grill, including this one, is that the insulated body holds in heat, making the grill far more efficient than a standard charcoal grill. This means less charcoal while giving it amazingly high temperatures. The Akorn can reach internal cooking temperatures up to 700 degrees F/370 degrees C. At the same time, because of the tight seals (older models of this grill didn't seal well and made it hard to control temperatures), it can cook at low and slow temperatures down to 200 F/95 C, making this a great smoker as well. The disadvantage of the Akorn: s that the lower grade materials and paints reduce the durability. Many have complained of paint and enamel burning off at very high temperatures. This can be a serious problem with this style of grill because temperatures can shoot up quickly if it isn't watched carefully when first lit. Since this is a metal grill, it will rust quickly if the paint or porcelain is damaged and several people have encountered this problem. The real bottom line here is that at this price point, the Akorn is a great way to get a kamado-style grill for a discount price. Many people who have had the earlier versions of this grill have moved on to ceramic models. Kamado grillers love their grills and this style of cooking and seldom switch to anything else. One last note, as with any kamado grill, there is a learning curve to its usage. Don't plan on buying one in the morning to use that afternoon. It is always a good idea to have a trial run or two first to get used to the temperature control.